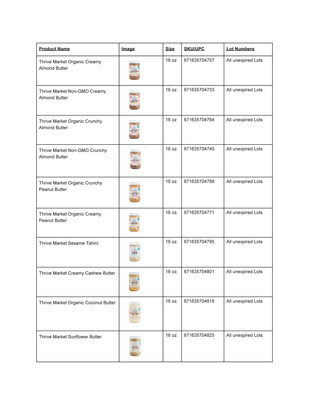 MARINA DEL REY, Calif., Jan. 25, 2019 /PRNewswire/ -- Thrive Market, Inc, is recalling all unexpired lots of the Thrive Market-branded nut butters listed below ("Product(s)") due to the potential for contamination with Listeria monocytogenes. On January 21, 2019, one of our suppliers notified us that it was issuing a recall of all nut butters it has manufactured since January 2018 because of a positive test for Listeria monocytogenes in recent lots. 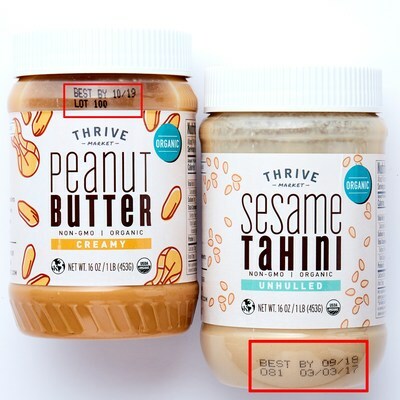 Because the safety of our members is our absolute priority, we are expanding on our supplier's recall and are voluntarily recalling all unexpired lots of all Thrive Market-branded nut butters manufactured by this supplier. Although it is very unlikely that the Product(s) you have purchased was affected by any contamination, out of an abundance of caution, if any of the Products listed below are in your possession, we ask that you please promptly discard it so that it cannot be consumed by you or others. The Products were distributed nationwide via Thrive Market's ecommerce subscription service to its members, as well as other online retailers. Specifically, the affected Products are shown in the attached PDF table. The "Best By" date and Lot code can be found on the jar above or below the label as pictured in image. Consumers with additional questions can visit our Recall Information FAQ webpage or contact our Member Services Team by emailing help@thrivemarket.com.